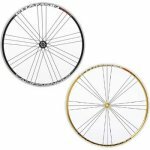 The Campagnolo Khamsin is a road clincher wheel at a entry price level using a 24mm high anodized aluminium rim, machined on the sides and with a wear indicator on the braking surfaces. Price is for a wheel set. Featuring: Weight: 855 g front, 1040 g rear, Dynamic balancing, Carbon and aluminium hub bodies, Sealed industrial bearings, Aero stainless steel spokes, Machined sides, G3 geometry (rear), Locking with light-alloy lever housing and Symmetric Action light-alloy lever, Monolithic FW body.